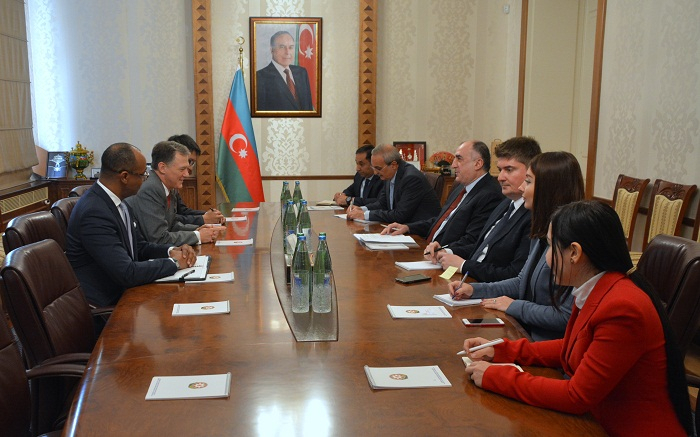 Azerbaijan’s Foreign Minister Elmar Mammadyarov on Wednesday received the U.S. Deputy Assistant Secretary of State for European and Eurasian Affairs, George Kent, the Foreign Ministry told News.Az. During the meeting the sides expressed their satisfaction with the successful development of political, economic, energy, transport and other fields of bilateral cooperation agenda and stressed the importance of increasing the efforts to deepen bilateral relations. Minister Mammadyarov briefed his interlocutor on important energy and transport projects implemented with the initiative and direct involvement of Azerbaijan, in particular the Baku-Tbilisi-Kars railway and the Southern Gas Corridor, and praised the U.S. support for the implementation of these projects. Touching upon Azerbaijan’s partnership with NATO, Mammadyarov stressed that Azerbaijan is committed to supporting international peacekeeping operations in Afghanistan. George Kent noted that the U.S. is constantly developing bilateral relations with Azerbaijan in energy, security, economy and other fields. He particularly praised the contribution of our country to peacekeeping operations in Afghanistan within the framework of the fight against terrorism. Speaking about the latest status of the negotiations over the settlement of the Armenia-Azerbaijan Nagorno-Karabakh conflict and the recent meeting held with Armenian foreign minister in New York with the mediation of the OSCE Minsk Group Co-Chairs, Elmar Mammadyarov stressed that the attempt to change the internationally recognized borders of states by use of force is unacceptable.